Jordan lake. Looking for bass on Jordan Lake during the summer depends on many factors. One is water generation. There are many spotted bass and largemouth’s that depend on this man-made current to bring the food to them. Some bass travel to the lakes headwaters in search of food and are stopped at upper Mitchell dam. Many species of fish practically stay here for the summer months, fattening up, until they get caught. 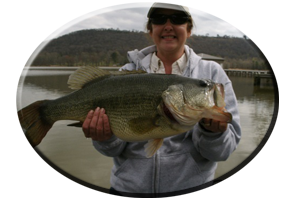 * There have been spotted bass weighing up to 8 pounds caught here during the summer on Jordan lake, with many in the 3-5 lb. class common. These are strong, current-oriented bass and hard fighters, especially when hooked in the swift discharge waters found just below Mitchell Lake dam. Its no wonder many of these chunky spots break anglers fishing lines, straighten out hooks or rip their mouths in an attempt to get free. There are rock bluffs, secondary rock ledges, huge boulders and deep, washed-out holes just below upper Mitchell dam. These are homes to the spotted bass that thrive on current, cooler water and chasing down an easy meal. There are many current breaks and eddies where these spots and some big largemouth’s hide in waiting for the helpless baitfish to wash by. When fishing these rocks, hang-ups are inevitable, especially when drifting in the swift current using bottom-bouncing grubs, shad imitations, lead tail spinners, worms, spinners, spoons and in-line lures like rooster tails. So bring plenty of spare lures. These, and many other lures fished from top to bottom, will also catch white bass, stripers and hybrid-stripes that feed in huge numbers all summer Jordan Lake’s swift headwaters. Topwater lures should be tried on each outing especially early and late in the day. Keep one rigged and very handy for often fast feeding surfacing schools of bass of all species can erupt near the boat and be gone in less than a minute. A quick cast to these foolish fish can produce some big summer bass. Down the lake, cover like shade producing piers and boathouses, current breaking bridge pilings and algae covered man made rip-rap rocks (on both lower lake dams and causeways) thick matted weed beds and main lake points, all constantly hold schools of bass during the summer. Creek mouths and main lake points should always be fished at all depths of 1-20 feet, to find the depth bass are holding in for the day. Deep diving crank baits and Carolina rigs are good search combos, with jigs and worms fished around the bank cover good during tough times in the sweltering heat. Or you can go night fishing. 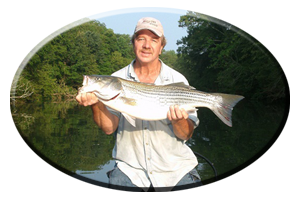 Night fishing on Jordan lake can be very exciting when hooking into a 5-8 lb spotted bass, 5-8 lb largemouth or hybrid or saltwater striped bass in the 10-20 pound range. As mentioned for day fishing, the upper dam discharge and immediate area below Mitchell Lake dam at the lakes headwaters, holds all species of bass during the summer. Water generation continues on into the night and fish feed just like in the day. They even hit the same lures, whether you are drifting in the current or when fishing the rocky banks. 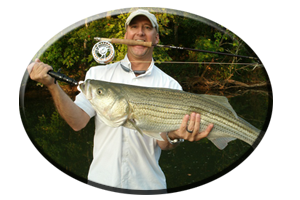 Fishing with spinnerbaits or drifting with heavier models in the current can bring some rod-bending strikes. Be ready with stout tackle, strong line and plenty of coffee to keep you alert. 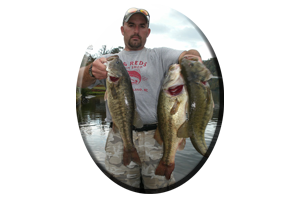 Sharp hooks and a good landing net will also aid you in getting some hefty bass in the boat. Jigs with oversized pork trailers simulate a full grown crayfish. 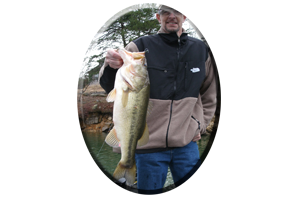 When fished among all the rocks at Jordan lake headwaters, getting bit usually results in a big, quality spotted bass or a monster largemouth. Rattles, sharp hooks and fish attractants are a plus on jig combos. Even topwater lures will take some foolish bass that are always looking up at night. When the water at the dam discharge is turned off is the time to throw loud topwater lures that can be stopped and allowed to sit in one spot. Injured baitfish are coming to the surface and some big bass move in for some easy pickings. Heavy line is suggested. Pop-r’s or chuggers, prop-baits like baby torpedoes, devils horses or crazy shads, walking lures like Excaliber’s Zara Super Spook or Excaliber’s Spittin’ Image are good lure choices. Down river on Jordan Lake, like all Coosa River lakes, has many lighted piers and marinas, boathouses, marinas, feeder creeks, roadbeds, points and islands. All of these lower lake regions have shallow water for bass to feed in at night during the summer. Worms, jigs, tube baits, crayfish imitations and spinnerbaits are all good lures in these places at night. All of these techniques will work throughout the summer at night on Jordan Lake, the last lake on the Coosa River System, situated near Montgomery.